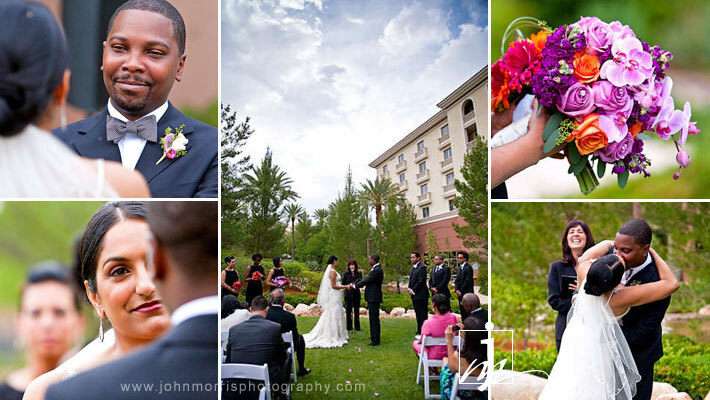 Corey and Simone are from Chicago and came to Las Vegas for an intimate wedding at the JW Marriott Resort in Summerlin. 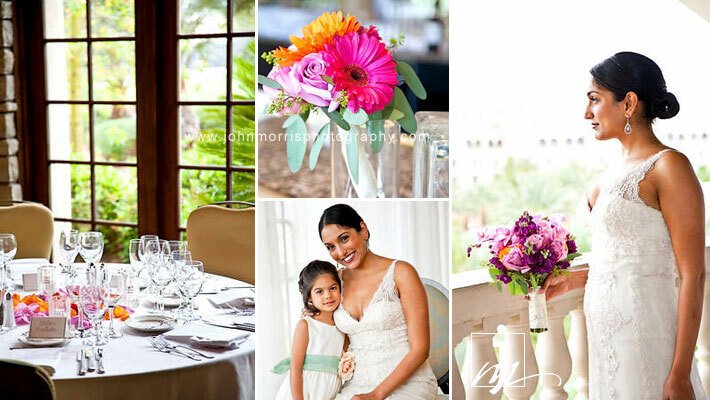 Their wedding took place in the beautiful lodge garden, one of the Marriott’s amazing private venues. It was a simple, romantic affair and every detail of the wedding was perfectly planned leaving a big impression on all of the guests. 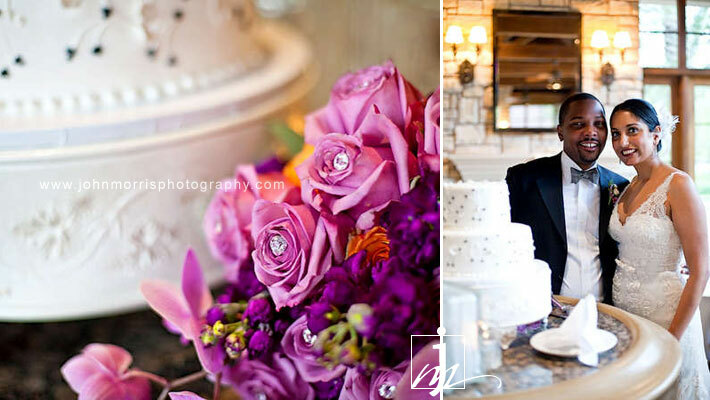 The bride wore a stunning lace dress accented with a bouquet of purple, lavender, and orange flowers. Her bridesmaids wore elegant, modern black dresses and carried bouquets of hot pink and orange flowers which added a colorful pop to the wedding. 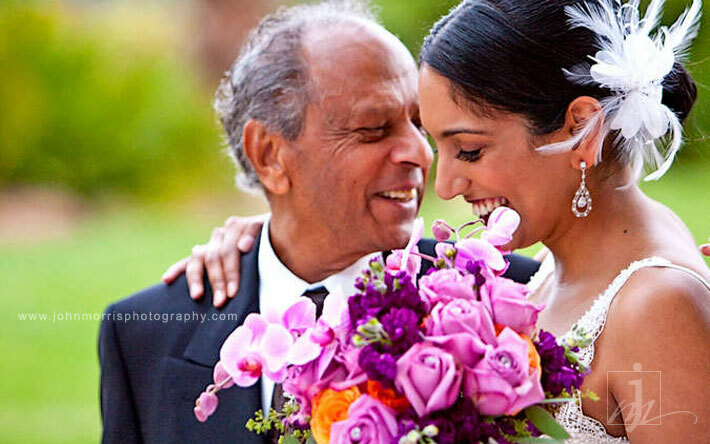 As the bride’s father said, Corey and Simone are lucky to have found each other. They make such a wonderful couple – it was great seeing how happy they make each other and how deeply in love they are. He is attentive and caring with a great sense of humor while she is sweet and supportive. The wedding day was really a dream come true for both of them. The guys wanted a cool, serious group photo but had a hard time keeping straight faces. Every time they all got serious, someone would crack a joke and everyone would burst out laughing. It was hilarious! The result was a series of fun photos that showed off their true personalities. The cake was absolutely beautiful – almost too pretty to eat! I really had a fantastic time working with Corey and Simone as well as their friends and family. They were such a nice, friendly and relaxed group of people. Everyone was having a great time and happy to be a part of the wedding. We were glad to hear that everyone loved the photos! What an amazing and crazy couple James and Danielle were! They contacted us earlier this year about photographing their wedding and then decided to have their engagement photos done as well. We are so glad they did because we love engagement sessions and the photos turned out phenomenal! I can tell you that things never get boring when these two are around. 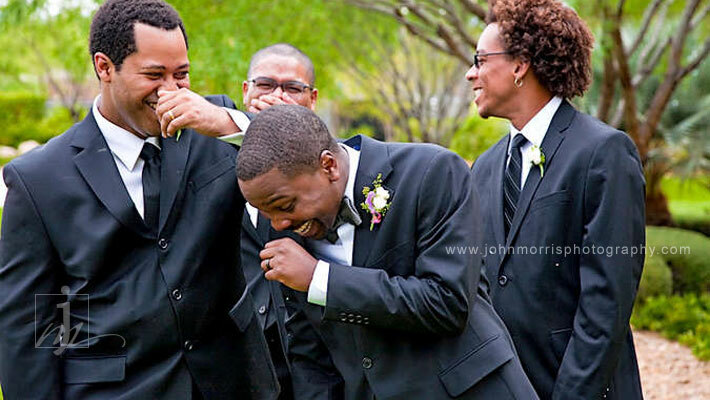 They are full of energy and kept me laughing the entire time with their offbeat sense of humor. We created so many creative, interesting shots in just a few hours. Here are a few of our favorite images from the session. Stay tuned for more! inly a couple of characters and the kind of people we love to work with. Thanks for keeping me laughing the entire time guys. I am really looking forward to creating more exciting, and quirky photos at their vintage themed wedding next month. Stay tuned for more. 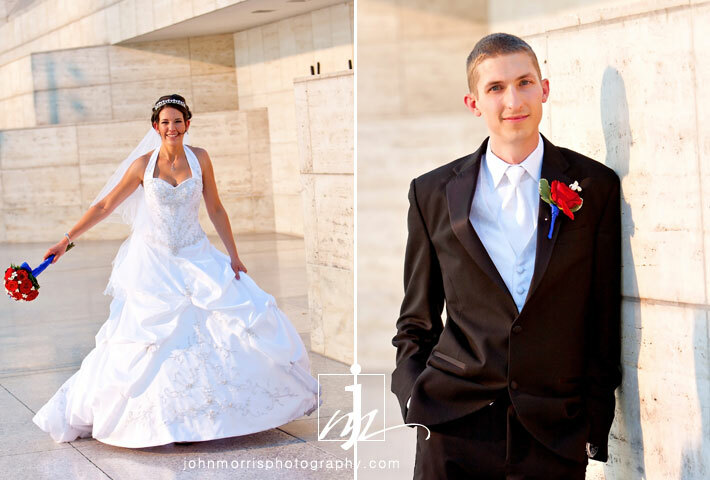 Here’s a quick preview of a wedding we just shot over the 4th of July weekend. Stephanie and Jason hosted a fun, relaxed event which they shared with 50 of their favorite people. We’re just glad we could be a part of it! The couple rented an Excursion limo to transport their guests and wedding party to the Las Vegas strip where we captured these colorful images. 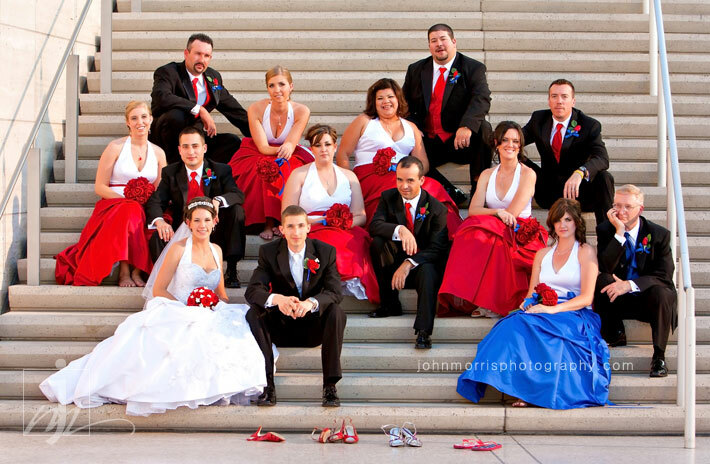 The wedding party looked stunning in their Independence Day colors. Congratulations Stephanie and Jason – thanks for sharing your day with us. Enjoy your first holiday as a married couple! Happy 4th of July to everyone! Have fun, and please be safe with those sparklers.